Norton Creek Press, August 2011, 308 pages. Suggested retail price, $17.99. ISBN 0981928471. Have you struggled to expand your initial idea into a complete story? Plotting can be frustrating work! What if there were a tool for this very problem, so you could navigate these uncharted waters as quickly as possible? A tool that starts with what you have (a situation, perhaps, or a group of characters) and sets you on the road to new possibilities? Plotto does all this. 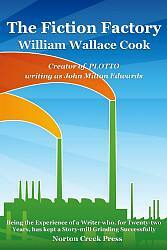 Created by a master of “organized creativity,” William Wallace Cook (one of the most prolific writers in history), Plotto has been prized by professional authors and screenwriters since its publication in 1928, and is still in demand today, with copies of the original edition selling for up to $400. This Norton Creek Edition is an exact reproduction of Cook’s work. To keep the book down to a manageable size (300 pages of small type) while retaining its powerful features, Cook uses a telegraphic format that takes some getting used to, so working your way carefully through the introduction and its examples is the key to professional-quality results. Because Plotto was written in the Twenties, its situations can seem old-fashioned and its terminology politically incorrect, but these problems are more apparent than real. Cook himself wrote both westerns and early classics of science fiction, so you see how replacing “stagecoach” with “star ship” or “dance hall girl” with “male stripper” are within the reach of anyone using the Plotto system, and, in fact, this kind of substitution is how the book is intended to be used, and is the key to its flexibility and enduring popularity. I first heard of Plotto in the late Eighties, when a technical writer friend of mine told me about it. In spite of having been out of print for 45 years, Plotto was so legendary that everyone but me seemed to know of its existence! Few had ever seen a copy, though. Finding rare books was difficult in the pre-Internet age, but the owner of the Antiquarian Archive in Sunnyvale had heard of Plotto and managed to find a copy for me at another store for a mere $130—which was (and is) a good price for a nice copy of the original edition. It was the most expensive book I’d ever bought, and I was not disappointed. I didn’t know what to expect from Plotto. By working methodically through the examples in the introduction, I soon figured out how the book is meant to be used. For those who have never seen Plotto, the closest I can come is Roget’s Thesaurus in its original, non-dictionary format, which is arranged to put similar concepts next to each other. If you don’t find what you’re looking for on the first go, you can scan the adjacent entries and often realize that what you were looking for wasn’t really what you wanted anyway. Close, but no cigar, and what you really needed was within a page or two. Plotto is like that. Sometimes you strike pay dirt right away, sometimes you have some false starts, and sometimes a “false start” suddenly clicks a while later, after you’ve dismissed it as unworkable. It works not by giving you ideas on a silver platter, but by bouncing ideas off you in a structured way, until one clicks. One thing about Plotto is that it can seem both too vague and too specific. The “masterplots,” which are very high-level plot descriptions, are too high-level to have much “zing” and need to be fleshed out. The main section of the book provides this fleshing-out process, and sometimes it can seem too specific, For example it might suggest a plot having to do with hidden gold dust buried by a Forty-Niner, when you were intending to write a science fiction story! All is not lost, since the whole point of Plotto is not to rehash old stories but to come up with new ones, and your SF story can easily accommodate a quite similar plot element, with someone who fits your future society hiding something of value. You’re expected to make this kind of change, so don’t let the details put you off! I actually find the specific suggestions easier to work with than the general ones, because they seem more human somehow, and changing details is easier than making them up out of whole cloth. Alas, my fiction-writing career has not yet propelled me on to fame and fortune (though I’m proud of my SF novel, One Survivor), so I can’t make any extravagant claims about Plotto’s role in my success. But when it happens to you, be sure to let me know! Keep in mind that Plotto is doubly indexed: first with the “Chinese Menu” of three columns, starting on page 12, and again by the main characters, starting on page 191. So if you’re looking for an idea involving a man and his daughter, you’d look it up in the index on page 191 and be referred to the situations on page 292. Whether you start with situations or characters, Plotto is the tool for you. Get the Plotto Instruction Booklet! Cook also wrote a detailed instruction booklet on how to use Plotto, covering its concepts in seven lessons, giving considerably greater detail than he did in the book itself. This booklet is a must-have: the difference between success and failure. 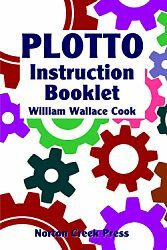 Norton Creek Press has reprinted the Plotto Instruction Booklet. Cook’s fiction output was so prolific that he was called “the man who deforested Canada.” He was an early adopter of many then-new technologies. He was one of the first writers to compose on a typewriter and to use card files to index an enormous collection of magazine and newspaper clippings. 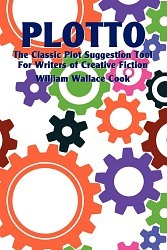 Plotto is an extension of Cook’s passion for efficiency and method in writing. See our How to Order page. And remember to order the Plotto Instruction Booklet as well!